Hand-assisted laparoscopy combines the principles of open and laparoscopic surgery to create a hybrid technique that was initially developed to shorten the learning curve for surgeons not trained in conventional laparoscopy. In addition, more complex laparoscopic procedures that failed to progress with standard laparoscopy could be completed with a hand-assisted approach instead of being converted to an open operation. The surgeon's nondominant hand is placed in the abdomen through a small incision to work in concert with the instrument-bearing dominant hand. A hand-access device is used to prevent the loss of pneumoperitoneum during the procedure. The hand-assisted technique confers certain advantages to the surgeon, especially the novice laparoscopist. It provides the surgeon with tactile sensation and spatial orientation and allows palpation of vessels and adjacent organs. The surgeon's hand is a versatile instrument for exposing, dissecting, and retracting tissue. In addition, as in open surgery, hemostasis, and intracorporeal suturing and knot tying are facilitated by the surgeon's nondominant hand. In performing hand-assisted laparoscopic live donor nephrectomies, the operative steps are identical to those already outlined for the standard laparoscopic approach. Unlike the standard technique, the extraction incision is made at the beginning of the procedure for placement of the hand-assist device. Selection of the proper incision site for placement of the device is critically important. The surgeon must be able to easily reach the superior aspect of the kidney to ensure complete mobilization and gentle handing of the allograft. For a left-sided donor nephrectomy, a periumbilical midline incision is used. For a right-sided donor nephrectomy, a modified muscle-splitting Gibson incision is made in the right lower quadrant. Direct comparison of the handassisted technique to the standard laparoscopic technique reveals similar donor and recipient outcomes. Generally, operative times are slightly less with the hand-assisted technique, whereas postoperative pain and cosmesis favor the standard laparoscopic technique. Selection of the proper incision site for placement of the device is critically important. The surgeon must be able to easily reach the superior aspect of the kidney to ensure complete mobilization and gentle handing of the allograft. For a left-sided donor nephrectomy, a periumbilical midline incision is used. For a right-sided donor nephrec-tomy, a modified muscle-splitting Gibson incision is made in the right lower quadrant. 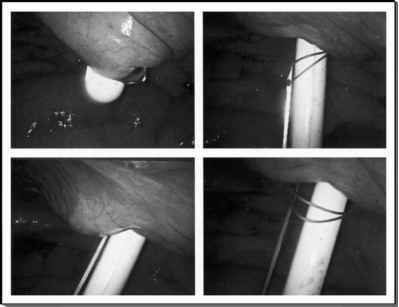 After insertion of a hand-assist device and establishment of pneumoperitoneum, the camera and working trocars are placed in the same positions as in the standard laparoscopic technique. During the procedure, the intraperitoneal hand is used to present tissues for dissection, and is especially useful in elevating the kidney during tran-section of the renal hilum. After division of the renal vessels, the kidney is delivered directly through the hand-assist device incision and does not require placement within an entrapment sac. This minimizes warm ischemia time to the allograft. There are numerous series in the literature describing the hand-assisted technique for live donor nephrectomy and reporting on outcomes for both donor and recipient allograft function (35-41). These series have shown hand-assisted laparoscopic live donor nephrectomies to be a safe, efficacious, and reproducible minimally invasive technique for renal donation. When compared with the open technique, hand-assisted laparoscopic live donor nephrectomies parallels the standard laparoscopic approach in terms of reduced donor morbidity while producing a healthy renal allograft for transplantation. Direct comparison of the hand-assisted technique to the standard laparoscopic technique reveals similar donor and recipient outcomes. Generally, operative times are slightly less with the hand-assisted technique, whereas postoperative pain and cosmesis favor the standard laparoscopic technique (36,37). With these results, hand-assisted laparoscopic live donor nephrectomies has emerged as a viable option to the laparoscopic surgeon for performing this technically challenging minimally invasive procedure.